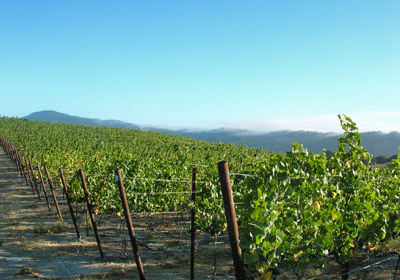 Red Dog vineyard, planted in 2000 is located high on the northwest flank of Sonoma Mountain. This panoramic mountainside site is the recipient of almost daily coastal fog and cool air flowing from the chilly Pacific through the Petaluma Gap and slamming directly into the upper reaches of Sonoma Mountain. The soils are low-vigor loamy clays. 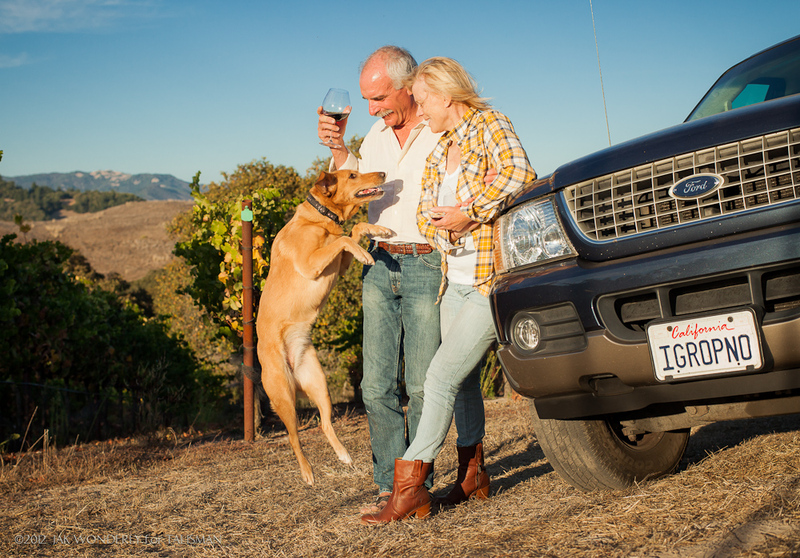 Tom and Debbie Engel tend this sustainably farmed vineyard with a careful eye to detail that is reflected in the wines. This vineyard has two very distinct microclimates – a west-facing slope on which Pommard clone is planted and an east-facing slope that is dedicated to Swan, Dijon 115 and 777 clones. This site ripens very slowly, providing perfect conditions for complete and complex flavor development. Fog often persists in the mornings when the sun has risen above the eastern slope and by the time that the afternoon sun has made its impact on the western slope, the cold air and fog begin their journey back from coast to mountain. Ginger, the original namesake red dog, reigned over these vines with great enthusiasm, keeping rodents and birds at bay and supervising vineyard crews. The new mascot, Honey has stepped in with youthful exuberance and focus. Ken Bernards at Ancien winery shares this vineyard with Talisman and bottles the only other Red Dog vineyard designated Pinot Noir. Talisman began bottling the vineyard designated Red Dog Vineyard Pinot Noir with the 2004 vintage, the inaugural vintage of Red Dog. These wines are typically deep, rich aromatic wines with blue, red and black fruits, sometimes a hint of anise and a lush but structured finish.